Author(s): Suzanne M. Cutts, Department of Biochemistry, La Trobe University, Victoria, 3086, Australia. Ada Rephaeli, Abraham Nudelman, Michal Ugarenko, Don R. Phillips. Doxorubicin has been in use as a key anticancer drug for forty years, either as a single agent or in combination chemotherapy. It functions primarily by interfering with topoisomerase II activity but in the presence of formaldehyde, it forms adducts with DNA, mainly with the exocyclic amine of guanine at GpC sites and these adducts are more cytotoxic than topoisomerase II induced damage. High levels of adducts form spontaneously from the endogenous level of formaldehyde in tumour cells (1,300 adducts per cell after a 4 hr treatment with doxorubicin), but substantially higher levels form with the addition of exogenous sources of formaldehyde, such as formaldehyde releasing prodrugs. The enhanced cytotoxicity of adducts has been confirmed in mouse models, with adduct-forming conditions resulting in much improved inhibition of tumour growth, as well as cardioprotection. Doxorubicin cardiotoxicity has been attributed to topoisomerase II poisoning, and the cardioprotection is consistent with a mechanism switch from topoisomerase II poisoning to covalent adduct formation. Although the adducts have a half-life of less than one day, a population remains as essentially permanent lesions. The capacity of doxorubicin to form adducts offers a range of potential advantages over the conventional use of doxorubicin (as a topoisomerase II poison), including: enhanced cell kill; tumour-selective activation, hence tumour-selective cell kill; decreased cardiotoxicity; decreased resistance to prolonged doxorubicin treatment. There is therefore enormous potential to improve clinical responses to doxorubicin by using conditions which favour the formation of doxorubicin-DNA adducts. Keywords: AN-7, AN-9, Cardiotoxicity, Doxorubicin, Doxorubicin-DNA adduct, Enhanced cytotoxicity, Formaldehyde activation, Formaldehyde-releasing prodrugs, Resistance mechanisms. Affiliation:Department of Biochemistry, La Trobe University, Victoria, 3086, Australia. Keywords:AN-7, AN-9, Cardiotoxicity, Doxorubicin, Doxorubicin-DNA adduct, Enhanced cytotoxicity, Formaldehyde activation, Formaldehyde-releasing prodrugs, Resistance mechanisms. Abstract:Doxorubicin has been in use as a key anticancer drug for forty years, either as a single agent or in combination chemotherapy. It functions primarily by interfering with topoisomerase II activity but in the presence of formaldehyde, it forms adducts with DNA, mainly with the exocyclic amine of guanine at GpC sites and these adducts are more cytotoxic than topoisomerase II induced damage. High levels of adducts form spontaneously from the endogenous level of formaldehyde in tumour cells (1,300 adducts per cell after a 4 hr treatment with doxorubicin), but substantially higher levels form with the addition of exogenous sources of formaldehyde, such as formaldehyde releasing prodrugs. The enhanced cytotoxicity of adducts has been confirmed in mouse models, with adduct-forming conditions resulting in much improved inhibition of tumour growth, as well as cardioprotection. 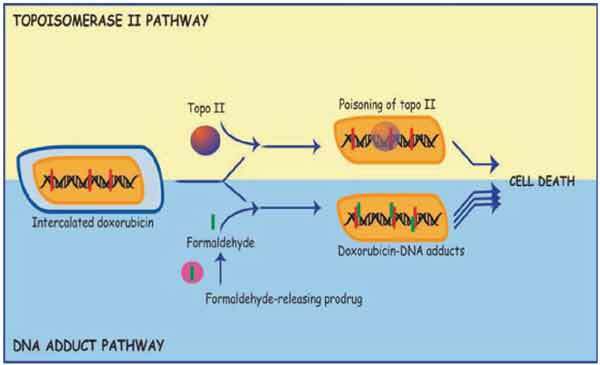 Doxorubicin cardiotoxicity has been attributed to topoisomerase II poisoning, and the cardioprotection is consistent with a mechanism switch from topoisomerase II poisoning to covalent adduct formation. Although the adducts have a half-life of less than one day, a population remains as essentially permanent lesions. The capacity of doxorubicin to form adducts offers a range of potential advantages over the conventional use of doxorubicin (as a topoisomerase II poison), including: enhanced cell kill; tumour-selective activation, hence tumour-selective cell kill; decreased cardiotoxicity; decreased resistance to prolonged doxorubicin treatment. There is therefore enormous potential to improve clinical responses to doxorubicin by using conditions which favour the formation of doxorubicin-DNA adducts.